Does holiday tipping make you tense? Join the club. Last year 11% of Americans admitted in a Consumer Reports survey that they dreaded handing out year-end gratuities. But with a few simple guidelines and a slight shift in perspective, you can manage this situation with grace. What you can afford depends on how many people you plan to thank. Start with people who help you care for yourself, your family and your home. That might include your barber or hairstylist, massage therapist, housecleaner, lawn and garden workers, babysitter and dog walker. The amount you give each person should vary. As a general rule, tip an occasional service provider approximately the cost of one session. And aim to give each person who helps around your home or takes care of your family members about a week’s pay. Simply allow for “about the same amount as you’d spend on these expenses in an average month,” Senning says. Cash is ideal for holiday gratuities, but prepaid gift cards also work. “It’s a way to personalize it, if you know somebody likes a certain thing,” Senning says. In the case of your mail carrier, though, steer clear of greenbacks; U.S. Postal Service regulations forbid employees from accepting cash tips and specify that gifts should cost no more than $20. For the professionals in your life, nonmonetary gifts are best. Giving your child’s teacher a present instead of cash will help you avoid any perception of trying to curry favor. For the staff at grandma’s retirement home, a group gift — such as a shareable basket of sweet treats — is more appropriate. If money is tighter than usual, or you didn’t include these tips in your holiday budget , don’t fret. A batch of home-baked cookies or another heartfelt present can be perfectly nice. Whatever you give, “a handwritten note is really important,” Senning says. “Part of any good tip is a genuine expression of thanks. Millennial or Boomer: Who Will Overspend This Holiday? 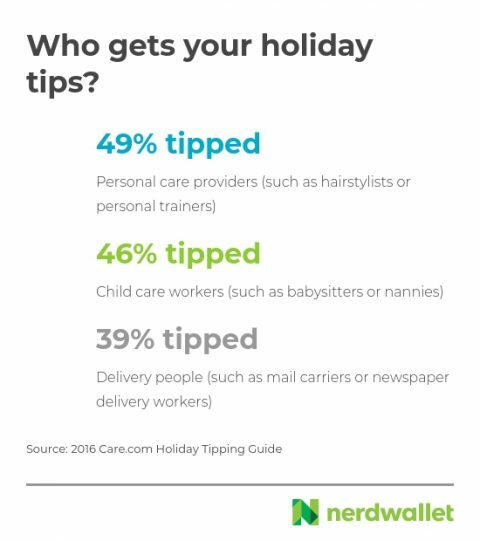 The article Holiday Tipping Guide: Whom and How Much originally appeared on NerdWallet.